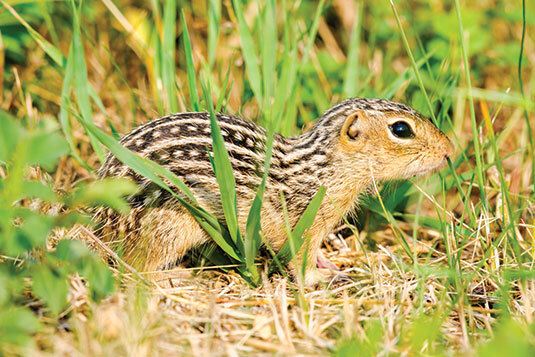 The thirteen-lined ground squirrel (Ictidomys tridecemlineatus) also is known as the leopard ground squirrel, squinney and striped gopher. Whatever you call this foot-long pest, see how well you know its anatomy and behavior. 1 Comment on "Quiz: Thirteen-lined ground squirrel facts you should know"
There needs to be clarity on questions #3 & #4. First,(#3) the range is South Central Canada to South Texas (page 104 Peterson Field Guide to Mammals). Mostly in the central part of the US. I actually have this species here in MI. (#4) While they are opportunistic feeders, their diet is mostly confined to seeds and insects. Feeding on shrews is irregular and limited to aggression between species as competitors.